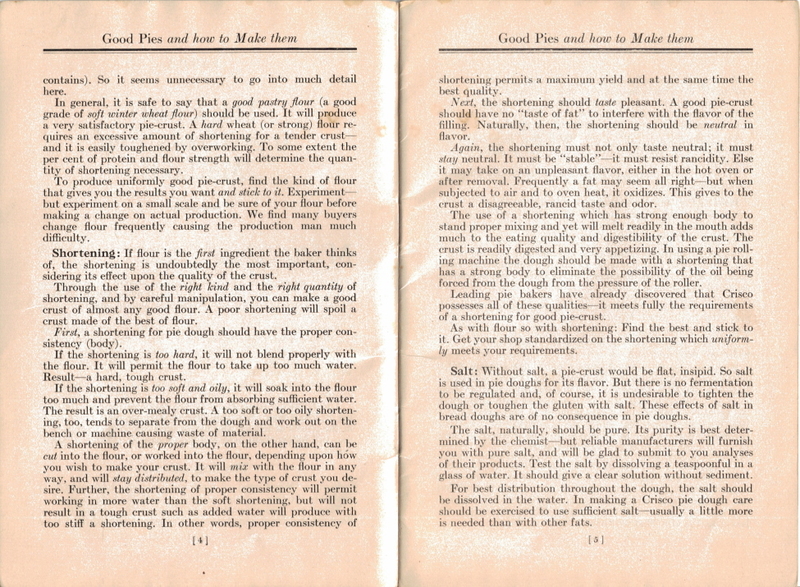 Here are pages 2, 3, 4, 5 and 6 of the vintage recipe booklet “Good Pies & How To Make Them” that was published in 1928 by Crisco (page 2 is a blank page). 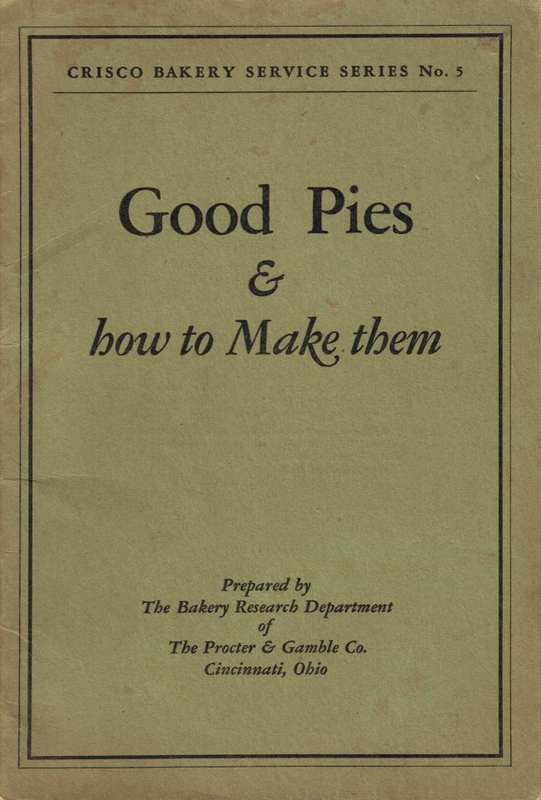 To review all pages in this booklet, simply visit the Crisco: Good Pies & How To Make Them Category and click on a page title to review that section. There are scans available of each page, just click the images to view a full size copy. May we say this at the risk of being over-obvious? A good pie is simply a good filling in a good crust. Filling and crust are equally important. Many an excellent pie-crust has been wasted on a mediocre filling. On the other hand, many a good filling has been completely spoiled because the crust was poorly made of poor materials. From the questions bakers ask us, it would seem that they experience much more difficulty in make a good pie-crust than in making a good filling. Yet, because the ingredients in a pie dough are so few, one would think that to make a good crust would be perfectly simple. To those bakers who know the “how” and the “why,” it is simple. The following suggestions are the result of long experimenting in the Crisco Research Bakery and practical experience in the plants of bakers who are turning out high-grade pies. 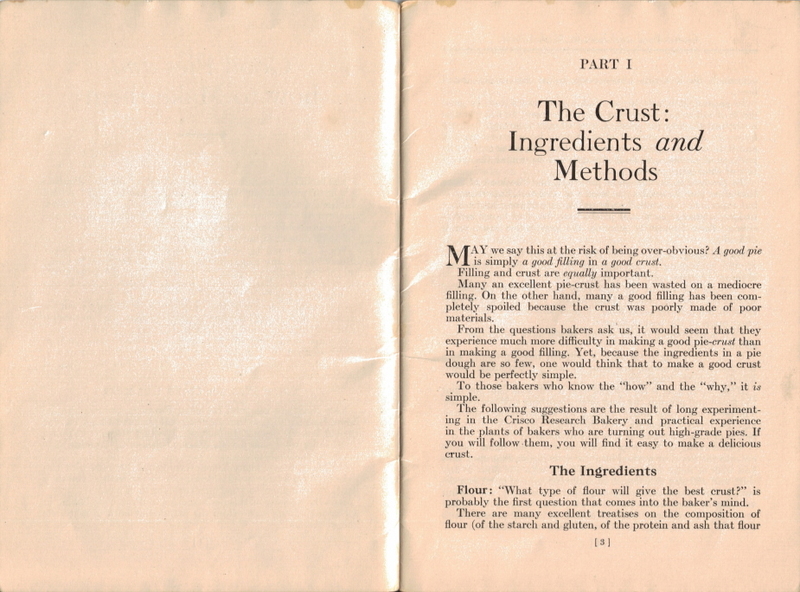 If you will follow them, you will find it easy to make a delicious crust. Flour: “What type of flour will give the best crust?” is probably the first question that comes into the baker’s mind. There are many excellent treatises on the composition of flour (of the starch and gluten, of the protein and ash that flour contains). So it seems unnecessary to go into much detail here. In general, it is safe to say that a good pastry flour ( a good grade of soft winter wheat flour) should be used. 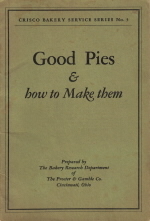 It will produce a very satisfactory pie-crust. A hard wheat (or strong) flour requires an excessive amount of shortening for a tender crust–and it is easily toughened by overworking. To some extent the per cent of protein and flour strength will determine the quantity of shortening necessary. To produce uniformly good pie-crust, find the kind of flour that gives you the results you want and stick to it. Experiment–but experiment on a small scale and be sure of your flour before making a change on actual production. We find many buyers change flour frequently causing the production man much difficulty. Shortening: If flour is the first ingredient the baker thinks of, the shortening is undoubtedly the most important, considering its effect upon the quality of the crust. Through the use of the right kind and the right quantity of shortening, and by careful manipulation, you can make a good crust of almost any good flour. A poor shortening will spoil a crust made of the best of flour. First, a shortening for pie dough should have the proper consistency (body). If the shortening is too hard, it will not blend properly with the flour. It will permit the flour to take up too much water. Result–a hard, tough crust. If the shortening is too soft and oily, it will soak into the flour too much and prevent the flour from absorbing sufficient water. The result is an over-mealy crust. A too soft or too oily shortening, too, tends to separate from the dough and work out on the bench or machine causing waste of material. 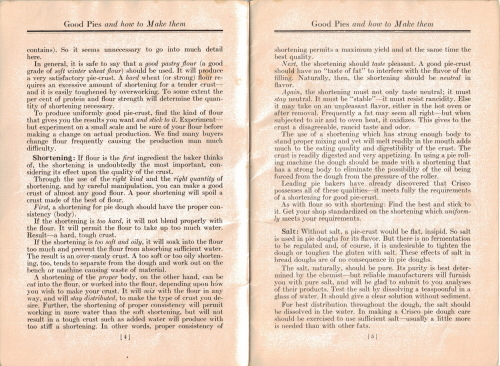 A shortening of the proper body, on the other hand, can be cut into the flour, or worked into the flour, depending upon how you wish to make your crust. It will mix with the flour in any way, and will stay distributed, to make the type of crust you desire. Further, the shortening of proper consistency will permit working in more water than the soft shortening, but will not result in a tough crust such as added water will produce with too stiff a shortening. In other words, proper consistency of shortening permits a maximum yield and at the same time the best quality. Next, the shortening should taste pleasant. A good pie-crust should have no “taste of fat” to interfere with the flavor of the filling. Naturally, then, the shortening should be neutral in flavor. Again, the shortening must not only taste neutral; it must stay neutral. It must be “stable”–it must resist rancidity. Else it may take on an unpleasant flavor, either in the hot oven or after removal. Frequently a fat may seem all right–but when subjected to air and to oven heat, it oxidizes. This gives to the crust a disagreeable, rancid taste and odor. The use of a shortening which has strong enough body to stand proper mixing and yet will melt readily in the mouth adds much to the eating quality and digestibility of the crust. The crust is readily digested and very appetizing. In using a pie rolling machine the dough should be made with a shortening that has a strong body to eliminate the possibility of the oil being forced from the dough from the pressure of the roller. Leading pie bakers have already discovered that Crisco possesses all of these qualities–it meets fully the requirements of a shortening for good pie-crust. As with flour so with shortening: Find the best and stick to it. Get your shop standardized on the shortening which uniformly meets your requirements. Salt: Without salt, a pie-crust would be flat, insipid. So salt is used in pie doughs for its flavor. But there is no fermentation to be regulated and, of course, it is undesirable to tighten the dough or toughen the gluten with salt. These effects of salt in bread doughs are of no consequence in pie doughs. The salt, naturally, should be pure. Its purity is best determined by the chemist–but reliable manufactures will furnish you with pure salt, and will be glad to submit to you analyses of their products. Test the salt by dissolving a teaspoonful in a glass of water. It should give a clear solution without sediment. For best distribution throughout the dough, the salt should be dissolved in the water. 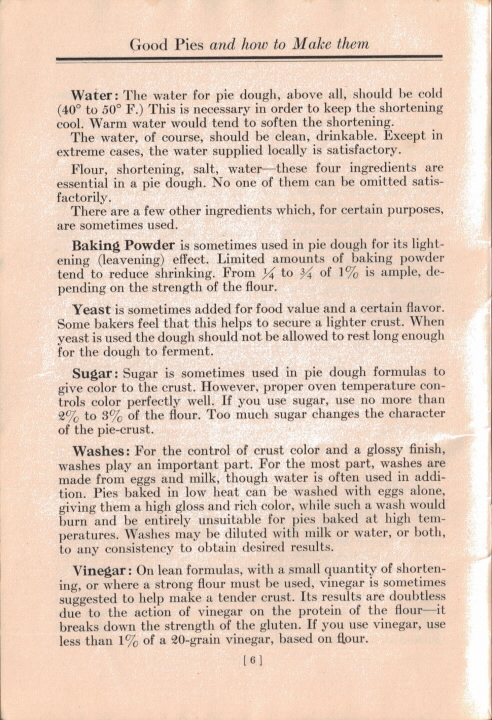 In making a Crisco pie dough care should be exercised to use sufficient salt–usually a little more is needed than with other fats. Water: The water for pie dough, above all, should be cold (40° to 50° F.) This is necessary in order to keep the shortening cool. Warm water would tend to soften the shortening. The water, of course, should be clean, drinkable. Except in extreme cases, the water supplied locally is satisfactory. Flour, shortening, salt, water–these four ingredients are essential in a pie dough. No one of them can be omitted satisfactorily. There are a few other ingredients which, for certain purposes, are sometimes used. Baking Powder is sometimes used in pie dough for its lightening (leavening) effect. Limited amounts of baking powder tend to reduce shrinking. From 1/4 to 3/4 of 1% is ample, depending on the strength of the flour. Yeast is sometimes added for food value and a certain flavor. Some bakers feel that this helps to secure a lighter crust. When yeast is used the dough should not be allowed to rest long enough for the dough to ferment. 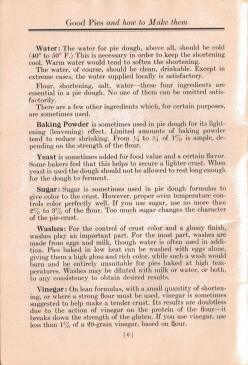 Sugar: Sugar is sometimes used in pie dough formulas to give color to the crust. However, proper oven temperature controls color perfectly well. If you use sugar, use no more than 2% to 3% of the flour. Too much sugar changes the character of the pie-crust. Washes: For the control of crust color and a glossy finish, washes play an important part. For the most part, washes are made from eggs and milk, though water is often used in addition. Pies baked in low heat can be washed with eggs alone, giving them a high gloss and rich color, while such a wash would burn and be entirely unsuitable for pies baked at high temperatures. Washes may be diluted with milk or water, or both, to any consistency to obtain desired results. Vinegar: On lean formulas, with a small quantity of shortening, or where a strong flour must be used, vinegar is sometimes suggested to help make a tender crust. Its results are doubtless due to the action of vinegar on the protein of the flour–it breaks down the strength of the gluten. If you use vinegar, use less than 1% of a 20-grain vinegar, based on flour.